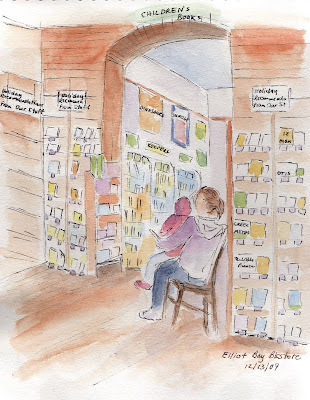 Sketching in Elliott Bay Books was like being a fly on the wall. It was really interesting to hear bits of conversations. Talks about good books, appeals to helpful staff for gift ideas and many comments from people who appreciate the bookstore and are sad to have it move. I also heard that the new location will be great.